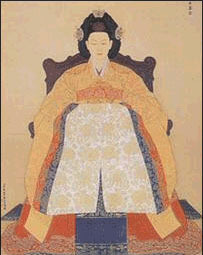 The empress of Emperor Gojong, the 26 th ruler of the Joseon Dynasty, was a keen diplomat who pursued openness and reformation throughout her life while maintaining her sovereignty. Empress Myeongseong's tumultuous life came to an end on the dawn of October 8, 1895 when she was murdered by the Japanese. This was the house she lived in from her birth until she was 8. In 1687, a hut for the emperor's father-in-law, Min Yu-joong, was built. Only the main building remains today, but in 1995, the building was restored to its natural state. In the room where the empress studied as a child, a monument was erected inscribed with the words, Empress Myeongseong Tangangguri (the village where Empress Myeongseong was born), to commemorate her birth.